Dr. William "Bill" Gropp is NCSA Director and Chief Scientist, and the Thomas M. Siebel Chair in the Department of Computer Science. 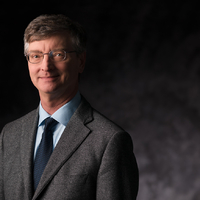 Dr. Gropp recently co-chaired the National Academy's Committee on Future Directions for NSF Advanced Computing Infrastructure to Support U.S. Science. In 2016, the Association for Computing Machinery (ACM) and IEEE Computer Society named Gropp, a professor of computer science at the University of Illinois at Urbana-Champaign the recipient of the 2016 ACM/IEEE Computer Society Ken Kennedy Award for highly influential contributions to the programmability of high-performance parallel and distributed computers. He has played a major role in the development of the MPI message-passing standard. He is co-author of the most widely used implementation of MPI, MPICH, and was involved in the MPI Forum as a chapter author for MPI-1, MPI-2 and MPI-3. He has written many books and papers on MPI including "Using MPI" and "Using Advanced MPI." He is also one of the designers of the PETSc parallel numerical library, and has developed efficient and scalable parallel algorithms for the solution of linear and nonlinear equations.